Your day-by-day itinerary now includes Sydney Opera House. 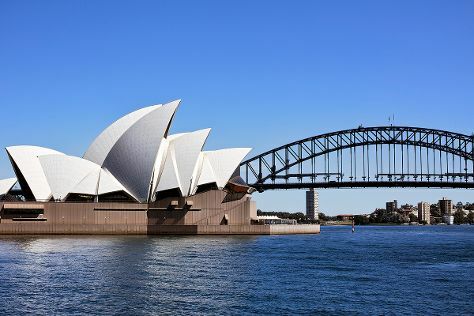 Kick off your visit on the 28th (Wed): see a show at Sydney Opera House, see the interesting displays at Hyde Park Barracks Museum, then enjoy the sand and surf at Manly Beach, then pause for some photo ops at Queen Victoria, and finally don't miss a visit to Queen Victoria Building (QVB). To see maps, traveler tips, more things to do, and tourist information, read our Sydney trip maker website . If you are flying in from Malaysia, the closest major airport is Sydney Kingsford Smith International Airport. November in Sydney sees daily highs of 29°C and lows of 19°C at night. Wrap up your sightseeing on the 28th (Wed) early enough to drive to Katoomba. You've now added Blue Mountains to your itinerary. On the 29th (Thu), take in the awesome beauty at Blue Mountains, take in nature's colorful creations at Everglades Historic House and Gardens, then get a dose of the wild on a nature and wildlife tour, then take some stellar pictures from Anvil Rock Lookout, and finally get great views at Govetts Leap. On the 30th (Fri), you'll have a packed day of sightseeing: make a trip to Echo Point Lookout, hike along The Giant Stairway, then admire the sheer force of Katoomba Falls, and finally don't miss a visit to Leura Cascades. To find other places to visit, ratings, photos, and tourist information, use the Katoomba trip planner . You can drive from Sydney to Katoomba in 1.5 hours. Alternatively, you can take a train. In November, daily temperatures in Katoomba can reach 32°C, while at night they dip to 17°C. Cap off your sightseeing on the 30th (Fri) early enough to travel to Wallerawang. Start off your visit on the 30th (Fri): get great views at Hassan's Wall and then explore the fascinating underground world of Glow Worm Tunnel. To see reviews, more things to do, where to stay, and tourist information, read Wallerawang travel itinerary planner . Traveling by car from Katoomba to Wallerawang takes an hour. November in Wallerawang sees daily highs of 32°C and lows of 17°C at night. Wrap up your sightseeing by early afternoon on the 1st (Sat) to allow time for travel to Blue Mountains National Park. This is the official community page for Blue Mountains National Park. On the 23rd (Fri), get great views at Anvil Rock Lookout and then take in the awesome beauty at Pulpit Rock Lookout. Keep things going the next day: admire the masterpieces at Norman Lindsay Gallery & Museum and then explore the fascinating underground world of Jenolan Caves. To see more things to do, other places to visit, maps, and more tourist information, you can read our Blue Mountains National Park tour website . Getting from Wallerawang to Blue Mountains National Park by car takes about 2 hours. In November, daily temperatures in Blue Mountains National Park can reach 32°C, while at night they dip to 17°C. Finish your sightseeing early on the 26th (Mon) to allow enough time to travel to Pokolbin. Start off your visit on the 4th (Tue): admire the natural beauty at Hunter Valley Gardens, learn about winemaking at Peterson House, then learn about winemaking at Hope Estate, and finally learn about winemaking at First Creek Wines & Winemaking Services. Get ready for a full day of sightseeing on the 5th (Wed): awaken your taste buds at some of the top wineries in the area, then do a tasting at Leogate Estate Wines, and then learn about winemaking at Scarborough Wine Co.
To find where to stay, more things to do, reviews, and more tourist information, use the Pokolbin online attractions planner . You can drive from Blue Mountains National Park to Pokolbin in 4 hours. December in Pokolbin sees daily highs of 32°C and lows of 19°C at night. Wrap up your sightseeing by early afternoon on the 6th (Thu) to allow time for travel to Anna Bay. Anna Bay is the name of a suburb, a town and a bay in the Port Stephens local government area in the Hunter Region of New South Wales, Australia. On the 6th (Thu), enjoy the sand and surf at Jimmy's Beach. Keep things going the next day: take in the views from Singing Bridge, then take in the waterfront activity at Soldiers Point Marina, and then look for all kinds of wild species at Tomaree Head. To see more things to do, reviews, other places to visit, and more tourist information, you can read our Anna Bay trip itinerary builder website . Traveling by car from Pokolbin to Anna Bay takes 1.5 hours. In December in Anna Bay, expect temperatures between 32°C during the day and 19°C at night. On the 9th (Sun), you're off tohome.